I have been writing about mining companies of all sizes and types since our websites and newsletters started over 20-years ago. Back then junior explorers' stock prices could soar on just the announcement of ground being staked near a major discovery, such as Diamond Fields' Voisey's Bay nickel-copper-cobalt play or Aber's Diavik diamond rush into Canada's north. These junior close-ology plays could last a few years on each wave of anticipation going into new rounds of drilling. In the end most crashed on results or as the Bre-X scandal broke, or simply faded away as financing dried up and investor interest switched to dot-com stocks. Many junior explorers even changed into hot new internet plays just in time for this next market bubble to pop. This article is not about these kinds of mining stocks. There will be a time when very high-risk speculative story plays will be in favour again, but it is certainly not now. Why even bother with new greenfield explorers when we may be at, or at least near, a special generational event when stock prices of established producers become so washed out that they can truly be considered value stocks. Not just mining, this is true for all risk assets including the biggest industrials. Just over seven years ago every major stock market worldwide crashed with the bluest of blue chips in the S&P 100 and even the Dow 30 falling 50% to 90% within a year. While small-caps generally outperform large-caps over time, why lose sleep looking beyond the safest mega-caps whenever they get this cheap. Note: These stocks also pay some of the highest dividend yields which were not factored in above! Note: All prices above are rounded and adjusted for any applicable stock splits. I'm not saying that I bought all of these stocks or even that it's easy. For example, after doing my homework on CBS in the $30's I had told myself that if it ever got down to $20 to start looking for an entry level. The stock sliced so fast through $20, $15, $10, $5 and then $3 that it spooked me away from buying—they must be going out of business and I'll have no football to watch between the truck commercials. The funny thing is that even if I had jumped in at $20, to then plunge 85% over the next year, I still could have tripled my investment; better timing could have produced as much as 20X! Most readers' emotions right now might range from fear to excitement. The key point to remember is that contrarian investing only works when dealing with great businesses with sound fundamentals that you know will come back as the economy and stock markets improve. Losses can be tolerated for a while as long as the company has a proven track record with valuable assets and low debt. You can't find this type of safe value at extremely low prices anymore. Mega-cap stocks are not cheap, bonds have next to no yield and remain dead money with real-estate still dicey. Where will the major money flows hide when the interest rate Boogiewoman becomes more than just a threat? Analysts provide useful data but I never look to them for advice. They have conflicts, their estimates and targets are usually wrong and they are almost always late. Look back at any of the above stocks and you will find that most were Buys at the top and Sells at the bottom, or at best Sells disguised as a Hold. I guess you could say I'm a contrarian investor that sees analysts as inverse value indicators. Gold was shunned as it bottomed at $252 per ounce in 2001, loved a decade later as it eclipsed $1,900 and is unloved again at today's $1,167. Many believe gold's revival came from fear trades after 9/11 to the mortgage crisis, with down momentum returning as stock markets strengthened with low inflation. Others point to buying or selling by central banks and Asia, to many other supply and demand factors. I believe these are just near-term trends within a long-term secular gold bull market, like symptoms or treatments that affect gold prices but don't cure the debt disease. 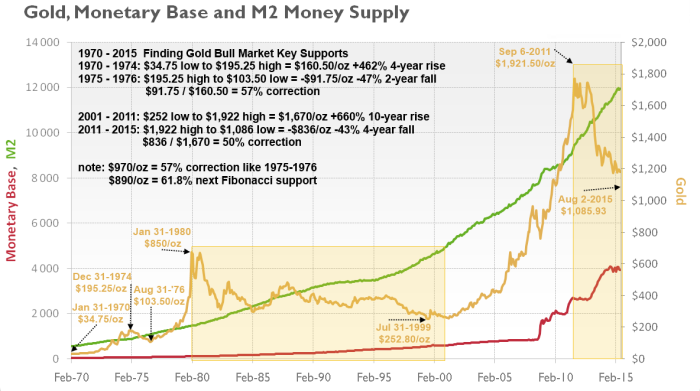 In 2009 when comparing the 1980 money supply and price inflation with today's, I wrote that gold could continue its run to $2,003 and silver at its historic 16:1 ratio to $123 per ounce. In 2011 gold got to $1,922 and silver hit $50. Gold ran more than $1,000 over its 1980 high as silver quadrupled but just touched its previous high again. The reasoning behind this hasn't changed as the many trillions of extra currency issued as debt since the great recession hasn't changed—it's still out there! Much of these extra trillions don't yet circulate on main street where prices could spike as credit gets spent. Instead it was issued to save the banks which can borrow for free and get windfall profits speculating in securities. Watch how gold jumps a buck or two on reports of refugees fleeing or violence escalating in Syria while it moves $20 or so on a U.S. labour report or Janet Yellen coughing just a hint about the timing of interest rate hikes. I also believe we actually have seen above average inflation simply hidden in the CPI as shrink-flation where product portions keep going down while prices stay the same. However we haven't seen 1970's style inflation which is a very possible outcome in a continuing economic recovery with a robust expansion. High or hyper inflation is a best-case scenario for gold and gold investments. Conversely as crunch time comes when the banks' free ride is over, with interest rates and lease prices rising on hedged carry trades to complex derivatives now representing well over a quadrillion dollars in counterparty credit default risks, how can this all unwind safely? As the next bubble bursts and economies fall into another recession, investors will again look to gold for shelter from uncertainty whether by bank failures, markets or currency crashes, political corruption or war. I'm starting to make Dr. Doom look cheery. This may seem extreme but has already happened. Equity margin leveraged at 10:1 imploded the 1929 stock market and portfolio insurance with blind program trading exacerbated the 1987 crash. Mortgage debt at 40 to over 100:1 brought Lehman and other banks down in 2008 and almost collapsed the global economy. In any event gold has held its value as real money for thousands of years and will continue to do so. On the other hand every government fiat currency scheme ever conceived has eventually failed and in the meantime persistently loses value. So why is gold only $1,167 an ounce today? In secular bull markets it is not uncommon to have corrections that can last weeks to a few years. At the end of 1974 gold topped at just under $200 but didn't bottom until the end of August 1976 at just over $100. Gold then steadily climbed back to $200 over the next two years when I'm guessing many investors sighed in relief to be able to sell at their breakeven. Gold then went parabolic and didn't finally top until the end of January 1980 at $850. This time gold seems like it only went up for a decade until late 2011 but actually pulled back 10% to 20% or more several times. The current 4-year correction from gold's 2011 top still isn't as deep as the 1975-1976 correction. Technical analysts use Fibonacci retracement ratios of 23.6%, 38.2%, 50% and 61.8% to find key support levels. Here's my math for the 50% Fib: $1,922 - $252 = $1,670 - 50% = $835. $1,922 - $835 = $1,087. Interesting how gold's summer low touched $1,072 to close at $1,086! Maybe that's the bottom as other newsletters have proclaimed recently. Then again didn't they call last year's low the bottom, and again the year before that? I'm not waving any flags yet. Instead let's look next at the 61.8% support at $890 per ounce. Also interesting is that these levels are very close to gold production all-in sustaining costs and operating cash costs—where miners breakeven and shut down. Surveys were showing average cash costs at around $950 an ounce with AISC around $1,150. These vary from mine to mine for many reasons and may be $50 to $100 per ounce lower now as most producers have been cutting labour, capex, opex and exploration costs and by high-grading resources. All miners are price takers and other than improving efficiencies and hedging with futures there is no way to add brand value to their end product—one miner's gold is as good as another's. Some say that if gold breaks its summer low there is little support until the key $1k psychological price level. Others say the cyclical cure for low prices is low prices and that sub $1,000 gold would result in so much supply being shut off that gold should turn around for this reason alone. Based on average mining costs I can't see gold going much below $1,000 unless a major producer suddenly goes bankrupt and spooks the market, which could create the high volume selling climax moment that often marks the bottom as short sellers cover and bargain hunters step in. So I still need a margin of safety in case prices overshoot on the downside or the turnaround takes longer than anticipated. This is why I am only considering miners with millions of proven high-grade low-cost ounces and a strong balance sheet with low debt and enough cash to pull through. Both parts must be there as what good is it to own a great asset that you can't afford to develop? To do so means years of studies and permitting to then dilute your interests as millions in shares and debt are issued, or by giving hefty chunks of your upside away via joint ventures, royalties or streaming arrangements to finance mine construction. I like some developers too, but producers turnaround first as they have completed all of these steps therefore derisking and simplifying your analysis of a company's true value and potential. In the 1990's you had to accept lots of drilling risk to get into gold cheaply. For the decade prior to 2012 you simply had to hold bullion or ETFs like (NYSE:GLD) or (NYSE:SLV) to beat the market. The strange thing is that miners in general did not keep up with their underlying metal prices. Why? Higher commodity prices instantly increase implied resource values and should have a multiplier effect on producers' profit margins and share prices. But this only works if growth and costs are well managed—they weren't! Typical of boom-bust cycles in other industries, major producers issued tons of shares and amassed huge debt acquiring companies with resources now worth much less and often uneconomical at today's lower metals prices. Shareholder value was further diluted paying Wall Street style management payouts as earnings were stalling, as energy and other costs kept rising. Higher commodity prices didn't turn into the profits, dividends, share buybacks etc. that investors expected. Gold producers' shares did go higher for a while, but a double is hardly satisfying if your revenues and margins should be going up closer to the seven-fold increase in the gold price. They M&A'd all the way up and have scrambled to sell all the way down to clean up their balance sheets. Investors hate mining stocks even more now as lower commodity prices are still outperforming shares of most miners—especially risk adjusted. Gold hasn't even halved as the vast majority of all mining stocks are now trading at around 10% of their 2011 high. I believe the major producers have learned a painful lesson and that mining stocks will outperform during the next upcycle as they used to do! Most of the major gold producers which I have looked at recently still have really ugly balance sheets. During past downcycles you could simply buy (NYSE:ABX)(TSX:ABX) Barrick Gold at $20 and wait for it to double again. Today at even a third of that price I see better value. ABX when quoted at our website shows a price of US$7.51 and market capitalization of $8.75B, with a negative P/E but still pays a $0.02 quarterly dividend yielding 1%. If you click the Financials tab and select Quarterly you see June total assets of ~$33B versus total liabilities of ~$23B. The $8.75B market cap is now 14% below shareholder's equity of ~$10.2B, much better than earlier this year. However, many of the gold stocks I follow are trading at substantially deeper discounts to book value. ABX is now down 46% from its 52-week high of $13.87 but is still not as cheap as I would like to see. At least it no longer trades at a premium to equity. My other concern is long-term debt which the June Q2 shows as $12.4B. Debt exceeds both ABX's market value and shareholder's equity which may represent leverage risk with a debt to equity ratio that I calculate at 2.26, which still seems high. While this is enough to make me look elsewhere, I wouldn't sell on that alone but would at least check what analysts and the rating agencies are saying. I am watching Barrick's $3B debt reduction plan which has resulted in $2.45B so far in mine sales and joint ventures, a recently closed innovative streaming deal with (NASDAQ:RGLD)(TSX:RGL) Royal Gold worth $610M with ongoing gold and silver payments from ABX 60% and (NYSE:GG)(TSX:G) Goldcorp's 40% Pueblo Viejo mine in the Dominican Republic, reducing capex by $300M and G&A by $90M next year. ABX has also paid back ~$250M with additional debt tender offers still open. I remain on the sideline for now and won't even look at gold resources or growth potential until debt fixes are further along, or ABX retests $5 and gets cheap enough compared to book value to warrant at least a punt. I don't mean to pick on Barrick but as the world’s leading gold miner, with projects spanning five continents, it is a bellwether stock that may tell us the healing state of the whole sector. ABX releases its hopefully not too scary Q3 after the close three days before Halloween. Some of my future articles will focus on the majors and mid-cap producers I'm following closest right now, which I hope will be cheaper by then. In the meantime, Part II next week focuses on three exceptional value penny stock gold producers with huge growth potential—one with essentially free gold and no debt. My calculations and observations are as an individual investor and are not recommendations. Data comes from financial reports, news releases, company websites and other public sources that may not be accurate, complete or up to date. There may be conflicts of interest as I own stock in some of these companies. I share these ideas in hopes that readers will comment on them and on other company stock boards at our website with their own insights, opinions and anything I may have missed.